This book helps beginning theological students grasp the basics of Christian theology. Consciously avoiding the perspective of one school of thought or confessional tradition, the authors provide the reader with a brief, broad overview of the questions and contents of theological study. Their accessible use of language, clear organization, and careful explanation will prove of invaluable aid to those who are getting their theological feet wet for the first time. "In the words of its authors, this book offers an introduction 'to the fuller spectrum of Christian theology as it has developed through the centuries.' Few writers address the historical development of the classic doctrines and the contemporary resonance as adroitly as Gonzalez and Perez. The chapter on Jesus Christ, for example, presents concise summaries of the treatments of Christ's person leading up to Chalcedon, while suggesting a need for a multiplicity of images in understanding the work of Christ that liberates the whole person and restores all creation. Beginning students, as a result, are invited into a living theological conversation, where the contested claims of the past have continued relevance in a contemporary era beset by its undervaluing of the body and creation. Broadly ecumenical in tenor, with reference to theologians from nearly every century, the work should appeal to both a popular readership and introductory students in college and seminary. One disappointing aspect of the book is an absence of Latino/a, feminist, and liberation perspectives. For a work that argues for the contextuality of all theology, and from authors whose previous work has been monumental in Hispanic theological education, this lack is surprising." ---David H. Jensen, Austin Presbyterian Theological Seminary, in Religious Studies Review, Volume 29 Number 3, July 2003. 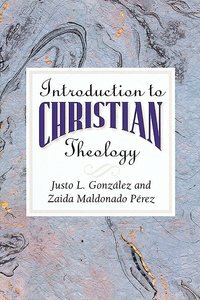 About "Introduction to Christian Theology"
ZAIDA MALDONADO PEREZ is Assistant Professor of Theology at Asbury Theological Seminary in Orlando, Florida.